I now have over five years of anime to re-watch. 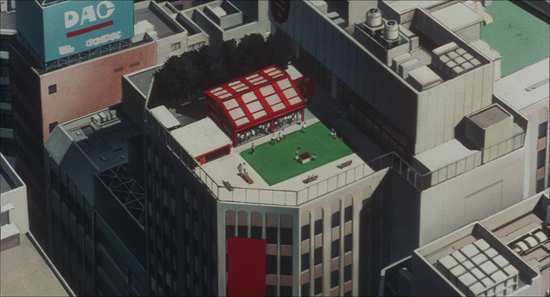 When I watch a new anime, it goes to the bottom of a figurative pile, represented by a spreadsheet; otherwise it would be taller than my house. I know this, as back in 2013, Anime Limited brought to us as one of their first releases, Perfect Blue on Blu-ray. I reviewed it, put the review disc at the bottom of the pile, and forgot about it until the next time it would come up for viewing. 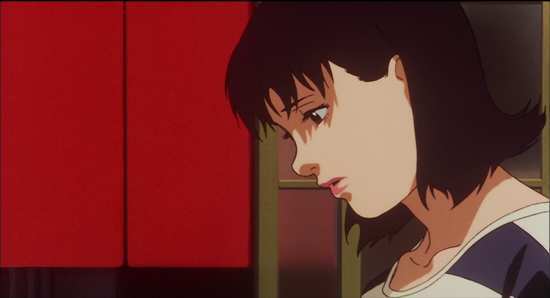 And as it finally reaches the top of the pile now in 2019, Anime Limited send me a check disc for their Ultimate Edition of Perfect Blue. Who needs broadcast TV! So let’s get the shock and awe out of the way first. 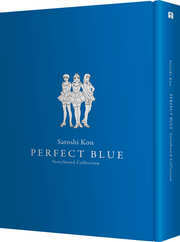 The Perfect Blue Ultimate Edition has a recommended retail price of £99.99. Pre-release discounts might have snagged it for as low as £60 at one point, but as I write, the exclusive Zavvi and All the Anime web shop release is somewhere between £80 and £90. For your money, the 80 minute feature film comes with a couple of new on disc extras, and more significantly a new transfer. You also get the original soundtrack CD, a 48 page companion book translated from the original Japanese, a 384-page complete storyboard book, and the UE packaging. I’ll refrain from sharing my personal opinion, but you will know if you love this film enough to want to pay the premium for the Ultimate Edition. For the purposes of this review, I only had the check disc to go on. One thing that I can state straight away is that all those niggles that I had with the previous release, with the subtitles, audio and disc presentation have been rectified with this release, although it isn’t immune from new issues. Reading around the subject on the Internet, there are plenty of opinions regarding the history of this film, which makes me question some of the presentation on this new disc, but more of that later. 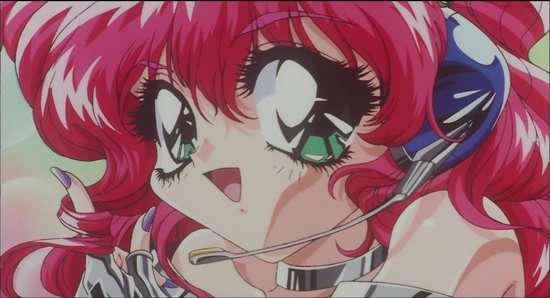 Mima Kirigoe is a pop idol with Cham, but Mima wants more than this, and decides to branch into acting, quitting the band. Her first role is a minor one in a detective drama, but when her agents ask for her role to be expanded, the writers oblige by writing an exploitative scene where her character is assaulted in a nightclub. It means the end of her wholesome pop idol image, but she feels obligated to the writers. But there are some out there who don’t want to let the pop idol go, and as Mima makes one bad decision after another, she begins to be haunted by the image of who she used to be. 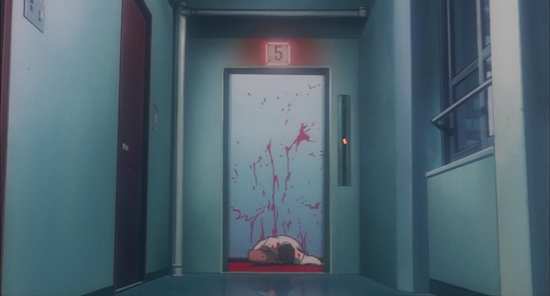 Then the scriptwriter who tainted her image is murdered. If you want to read more about the film, click here for the review of the previous release. This review will concentrate more on the technical changes for this new release. Contentious issue #1, the transfer. 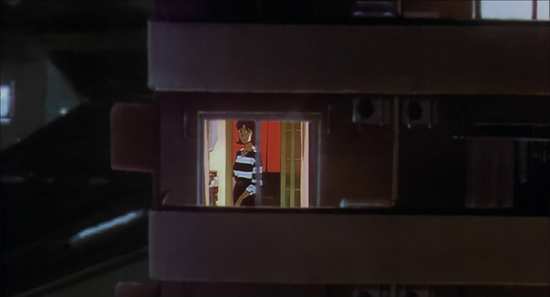 I’ve read that the original camera negative to Perfect Blue was destroyed. That is easy to believe given how anime was considered in Japan not too long ago (a bit like Doctor Who in the sixties); disposable. 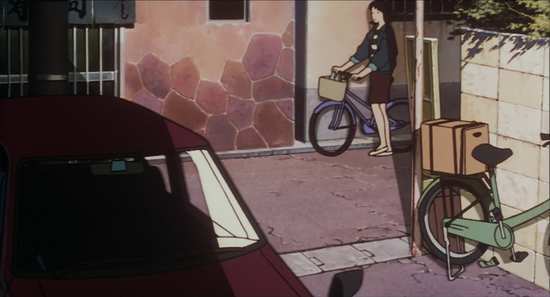 What is harder to believe is that no inter-positives or film prints for Perfect Blue exist at all. The original DVD, the previous Blu-ray and this Blu-ray were all sourced from a telecine transfer (telecine is the process that converts film to a medium suitable for TV broadcast or home video release). This Blu-ray is authored using the same master as the previous disc; any improvements in presentation come from tweaking and enhancing that master. This is a dual layer disc, which gives the film more room to breathe this time, with the whole package including extras now taking up 36GB as opposed to being limited to 25 as before. But you can immediately see the difference in the presentation. 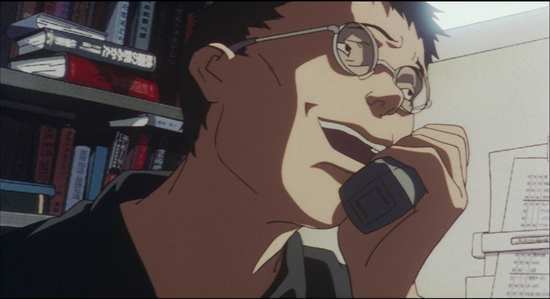 The 1.85:1 widescreen 1080p transfer may exhibit the same wobble as before, and has about as much effective resolution and overall detail, but those are the only similarities. The colours for this release have been tweaked, to make them richer and more vibrant. The biggest difference is in the blacks, which are stronger and more intense on this release, as to the barely grey on the previous disc. This has had the charming effect of actually making shadow detail strong and better defined. The downside is that the dreaded DNR has been applied (quite possibly to make the process of enhancing the colours easier to automate), and grain has been pretty much stripped from the film. This telecine transfer never had much in the way of detail to lose, but the film does feel softer as a result. Certainly there were moment of motion that felt almost early 2000s digital video in quality. I’m not fond of DNR at the best of times, and I’m actually torn on how to evaluate this release. In the end, the richer colour balance, and the added dark detail is a bigger plus to me than the negative of grain removal. It is a better transfer than before, but not as good as it could have been. Here are some comparison shots, new transfer top, old at bottom. Contentious issue #2. The audio, although in this case it’s the presentation in the menus that raise an eyebrow as opposed to the actual audio. The disc menu offers the choice between the surround remix and the original mono. 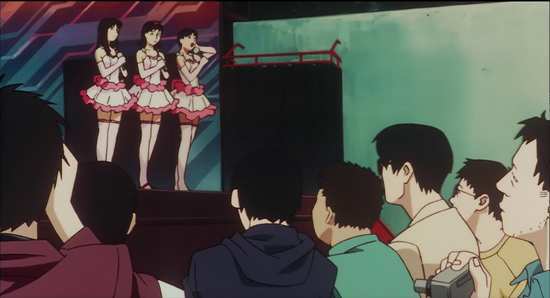 But once again, reading on forums debating the merits of this Ultimate Edition, I understand that Perfect Blue’s native audio was the 5.1 surround. It certainly makes sense given how natural and immersive the audio is, really enhancing the psychological horror of the story. By and large, this disc repeats the same audio as before, a DTS-HD MA 5.1 Surround Japanese track, a Dolby Digital 5.1 Surround English track, and the DD 2.0 (stereo sounding) mono Japanese with optional translated English subtitles, hard of hearing English ‘dubtitles’ and a songs and signs only track. The audio options are matched to the correct menu listings this time around, and more importantly the subtitle flubs on the first release have been corrected for this version, and also the missing line on the first disc’s Japanese surround track has been restored. Contentious issue #3. The extras. There are a couple of new extras on this release, which both raise questions. The biggest question comes with the Original SD version of the film (basically the Manga DVD version) presented in 1.85:1 letterbox 480i with zoom unfriendly subtitles, and DD 5.1 English, Japanese, and DD 2.0 (mono?) Japanese. Now there was a Special Edition Star Wars release that had the original version of the films sourced from laserdisc on bonus DVDs. That made sense. 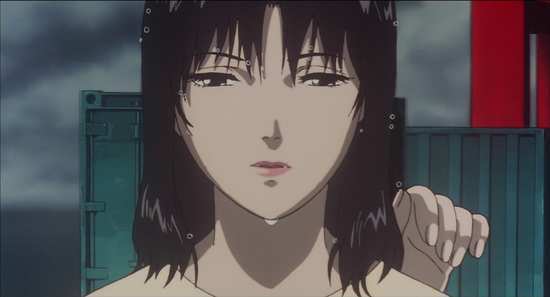 Manga Entertainment’s Blu-ray release of Ghost in the Shell 2.0 had the original version of the film in 1080i format on the disc. But this is the exact same movie as the HD version. It’s pointless padding. It’s not like you can use it in a DVD player. 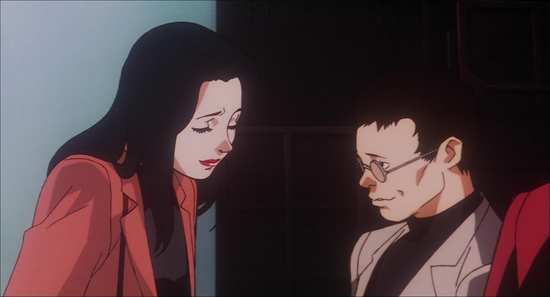 Then there is the Satoshi Kon Lecture, filmed in 2007, where the director talks about key moments from the film, meanings and intentions of the filmmakers, and some of the history of the making of. It’s presented in 1080i and lasts 41:10. It’s a wonderful extra feature and a nice addition to the film. Except that on those forums that I mentioned, it seems that this is a truncated version of the Lectures, sourced from a Taiwanese release, and that the original length of the lectures was closer to 2 hours. The rest of the extra features are ported over from the previous release. The 3 English interviews are voiced over clips of the film, and include chats with Ruby Marlow, who talks about dubbing Mima (2:39), Wendy Lee who voiced Rumi (2:19), and Bob Marks, who talks about voicing Mr Me-Mania (1:58). Then there is a chat with Junko Iwao (5:41), who talks about how she was cast for the role of Mima, as well as her impressions of the character. This is a live interview, and is subtitled (burnt in) in English. 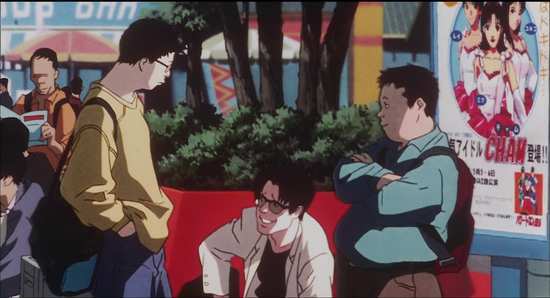 Finally there is an interview with director Satoshi Kon (10:45), who talks about directing his first animated feature, as well as the story he intended to convey. “The Angel of Your Heart” Recording Session lasts 4:22 and you can see Cham recording the song in the studio. You can then hear the English dub of this song against a still image from the film (1080p) and this lasts 4:18. 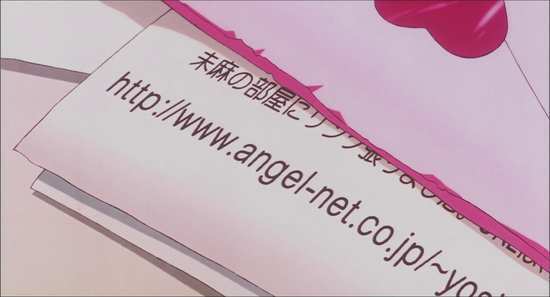 The English credit scroll from the Manga Entertainment release is presented here. Finally you have the original UK/US Trailer, the UK Re-release trailer, and the Japanese trailer, all three presented in 1080p. (The Japanese trailer on the previous disc was presented in a bizarre 480p format that kept crashing my player). 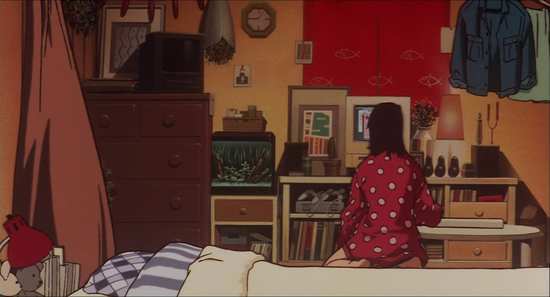 I love Perfect Blue. 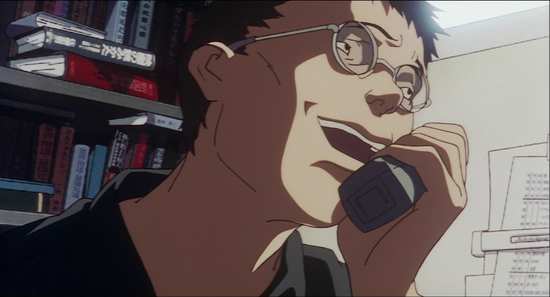 It’s one of the best anime movies ever made; no it’s a great movie full stop, influential and unique. 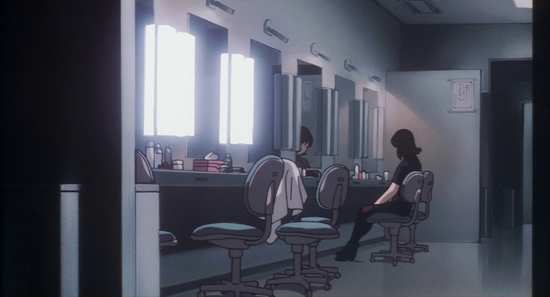 Certainly I’ve never seen its like before or since, and it once again goes to show just how visionary a genius Satoshi Kon was, and just how tragic a loss to cinema and the anime industry when he died so young. 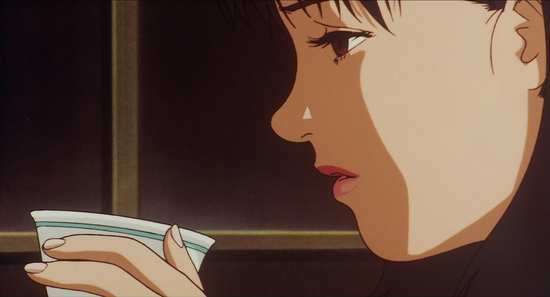 If you haven’t seen Perfect Blue, then regardless of what you think of anime, take some time out and get acquainted with this thriller; you won’t be disappointed. But once again, I find myself taking issue with the use of the word ‘Ultimate’ in one of Anime Limited’s top tier releases. Sure, you won’t get a better package for Perfect Blue in English speaking territories, but at no point should an Ultimate Edition release have you opining on how to make it better. I do like this re-mastered release though, despite my misgivings. The richer colours, the better contrast and added clarity in darker scenes is a big enough positive that even when offset by the aggressive DNR, it results in a disc that I enjoyed watching more than the previous release, certainly helped by the corrections to the audio and subtitle flubs. It is a better disc. Once again, the decision on whether to buy an Ultimate Edition release depends on how much you love the film, how much the overall package appeals. But I will say this. It would be a crime if this re-mastered version of the film doesn’t get a Standard Blu-ray release down the line.